Just like anything in an old house, interior and exterior locks should be replaced at some point as well. With millions of homes getting broken into every year in the country, refreshing the security locks at home is something that should be done every few years. Not all home break-ins can be avoided. However, starting with refreshing an updating the locks on the front door of your home is something that can help preventing significantly. With modern technology there are a wide range of locks that can provide decent security for your home. However, with so many options, things can get confusing at times. However, there are three major types of home security locks for exterior use which are keyed door knobs, handle-sets and deadbolts. The main purpose of a lock is to provide security to the property by keeping intruders out. The need for a particular type of lock will be depended on various variables such as your budget, exterior or interior property use, and more. 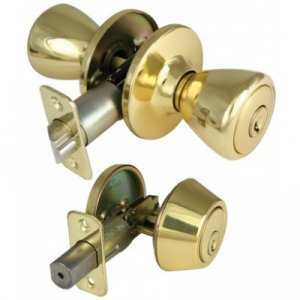 For exterior use, normally you would want to go with the a decent quality lock which will provide high level of security since it provide a line of defense against intruders. Adding a deadbolt as a secondary lock to the front and back door of your home is important. There are several options that will allow you to either combine a door knob lock and a deadbolt as part of a handle-set or add the deadbolt separately. The cost may vary depend on the type and style of the lock or set. 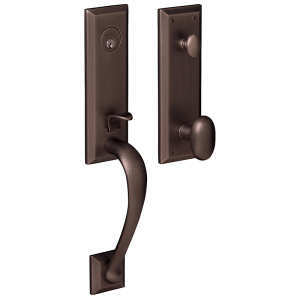 Normally, handle-sets will come in a decorative form so most likely the cost will be on the higher end. ANSI Grade rating is also something to look for as it points to the quality and reliability of the the right lock. Grade 2 are normally the best choice for exterior use and will be made out of solid and forged brass. Although a handle-set can be pricey, it can enhance the exterior appearance of your home since most types come in various styles and designs. In addition, it will add convenience as both the deadbolt and latch can be opened from the inside at once instead of each separately. This can be very useful in case of an emergency and for added convenience in general. Looking into Master-Keying which will enable you to have single control on all the doors in your residential property regardless of the type of locks that are found on the door. In such case, you can limit the access to certain rooms in the property while reserving the accessibility for yourself.